Adobe's Photoshop doesn't really need much of an introduction, since it was launched nearly two decades ago it has become the de facto standard for professional image edition and these days even the most computer illiterate people know the meaning of "photoshopping". In this review I'm taking a brief look at the new features of Photoshop CS4, the eleventh iteration of the program, wich is a somewhat larger update than the two previous releases. The new Photoshop introduces a load of worthwhile new features (including 64-bit support), improves old features and also promises better performance and stability than its predecessor. SAN JOSE, Calif. — Sept. 23, 2008 — Adobe Systems Incorporated (Nasdaq:ADBE) today announced Adobe® Photoshop® CS4 and Photoshop CS4 Extended, the highly anticipated, new editions of the professional industry standard software for digital imaging. Providing a fluid user experience, complete creative control and higher efficiency, Photoshop CS4 leverages the power of the latest hardware to extend imaging possibilities and offer faster, more flexible ways to accomplish core tasks like image adjustments and masks. All of these features and more can be found in Photoshop CS4 Extended, which serves users with advanced motion graphics functions, dramatically expanded 3D visualization capabilities and precise image analysis. Photoshop CS4 and Photoshop CS4 Extended will be available as stand-alone applications or key components of the Adobe Creative Suite® 4 family (see separate releases). Finding, previewing and managing image assets jumps to a new level of power and convenience with Adobe Bridge CS4, beginning with fast start-up performance, right through to speedy transfer of images to Photoshop CS4. New path-bar navigation and workspace selection buttons across the top of the Bridge window let you instantly go to just the right display for every task. Also included are new Camera Import controls, visual folder navigation, and a Carousel View for larger image-group selections. Photoshop CS4 takes advantage of the latest graphics processing unit (GPU) hardware to deliver superior performance. The software offers a smooth pan and zoom experience that allows users to easily edit images at the highest magnification while maintaining clarity. 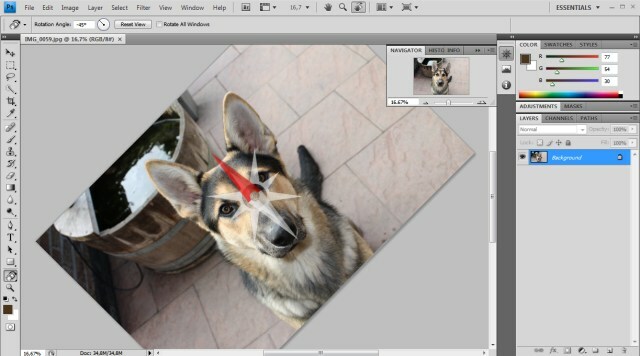 The new Canvas Rotation tool makes it simple to rotate and work on an image from any angle. Photoshop CS4 helps keep work areas clutter-free with a new unified application frame, tab-based interface and self-adjusting panels that make it easy to quickly access advanced tools, and provide a more fluid way to interact with the application. Photoshop CS4 Extended includes all the new features of Photoshop CS4 plus the ability to manipulate 3D imagery easier than ever before. Now, creativity knows no bounds, as users can paint directly on 3D models and surfaces, merge 2-D files onto 3D images and animate 3D objects. The 3D engine has been rebuilt from the ground up to provide faster performance, allow editing of properties like light and the ability to create more realistic renderings with a new high-quality ray-tracer. Video professionals have the ability to turn any 3D object into a video display zone and can animate 3D objects and properties with ease. 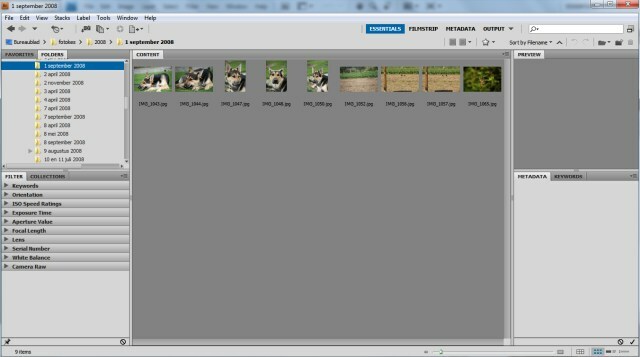 In addition, the core motion graphics editing has been improved with more efficient single-key shortcuts. The Photoshop product family has experienced an unprecedented year, in which new products have been introduced and every existing product has been updated. The year began with the anticipated launch of Photoshop Elements 6 for Mac, winning Best of Show at Macworld 2008. The launch of Photoshop Express in the Spring marked a new direction for the line — a free, rich Internet application (RIA) for anyone who wants to store, sort and show off digital photos online with eye-catching effects. 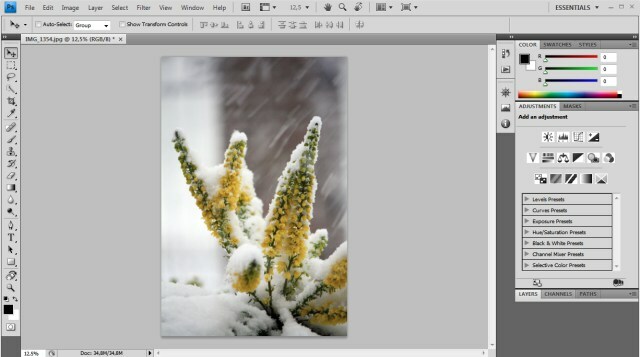 In July, major updates and enhancements were made to the popular Photoshop Lightroom™ 2 solution for serious photographers, followed by the launch of Photoshop Elements 7 and Adobe Premiere Elements 7 software for hobbyists and now, Photoshop CS4 and Photoshop CS4 Extended for professionals. Adobe Photoshop CS4 and Photoshop CS4 Extended for Mac OS X on Intel® based and PowerPC® based systems and for Microsoft® Windows® XP and Windows Vista® platform are scheduled to ship October 2008 with availability through Adobe Authorized Resellers and the Adobe Store at www.adobe.com/go/gn_store . Estimated street price for Adobe Photoshop CS4 is US$699 and US$999 for Photoshop CS4 Extended. Upgrade pricing is available. For more detailed information about features, upgrade policies and pricing, please visit: www.adobe.com/photoshop . As soon as you boot up Photoshop CS4 and start working on an image you'll note that Adobe has made various changes to the user interface to reduce clutter and consolidate your workspace, like the new tabbed environment for your images, the new Adjustments and Masks palettes, floating panels, and some other minor enhancements, such as a pixel grid that kicks in once you magnify an image over 500%. Moreover, the bootup time also feels noticeably faster than before. Adobe added support for OpenGL in Photoshop CS4, this is mainly used to enhance zooming and panning. Pictured below is the new non-destructive rotating mode that can be accessed by pressing "R" on your keyboard. This might be helpful when editing images and the OpenGL support makes it very responsive, rotating happens in real-time. 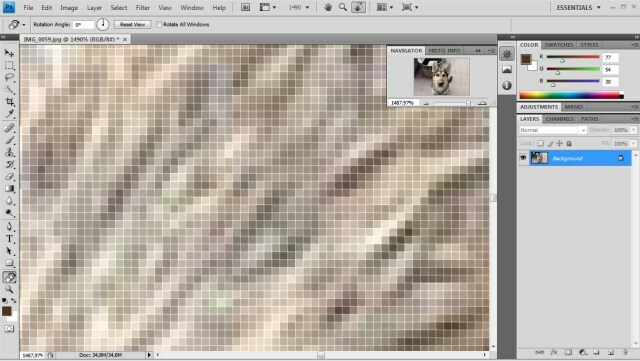 One of the catchiest new features in Photoshop CS4 is the content-aware scaling, a technology that intelligently resizes images to produce more natural looking images. 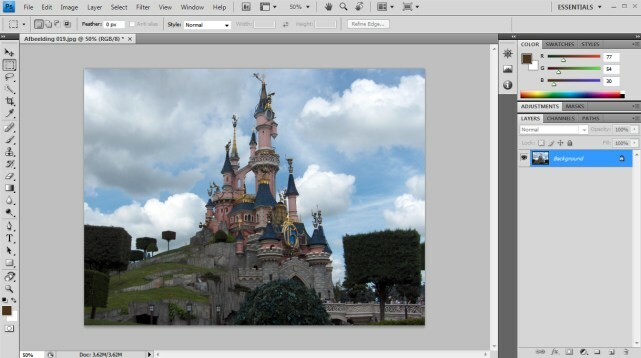 Lets say you want to fit a wide image like the shot of this Disney castle in a narrow column, but can't use cropping as you still want to preserve some of the scenery like the hill on the left. 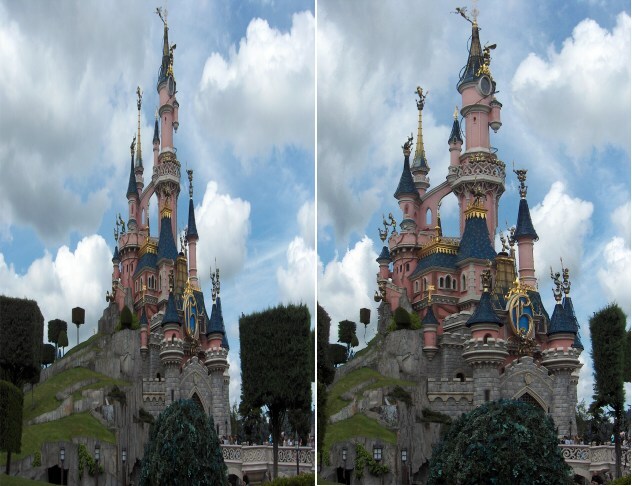 The regular scaling tool produces a pretty bad result (left), while the content-aware scaling detects that the castle is the most important object in the picture, and changes the image to produce a quite pleasing result. The feature is not perfect, as you can see the right tree is quite warped, but it's very easy to use and enables you to achieve reasonably good results with just a couple of clicks. Retouchers will also be pleased with the new "Protect Tones" feature for the Dodge and Burn tools, and the "Vibrance" adjustment for the Sponge. The Bridge file manager received various updates such as a new Output panel that lets you create web galleries, faster performance and enhanced navigation, while Camera Raw 5 now allows you to make localized adjustments. The best got even better. While the previous two versions didn't really provide compelling reasons to upgrade, CS4 is definitely a worthwhile update. I give Adobe Photoshop CS4 a 9/10.